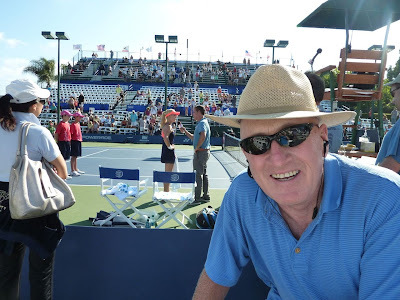 We watched some quarter-final matches at the Southern California Open today. The tournament, held at the La Costa Resort, is a shadow of its former self. What was once a "Tier 1" event sponsored by Acura has been sold off to a foreign country. Now we're left with a "Tier 3" tournament that is avoided by many of the top women players. My pet peeve is the venue's "no outside food and beverage" policy. Last year our friend had a bag of Skittles confiscated from her purse! We called them the "food gestapo", and I'm not about to let them intimidate me! So I walked to a Mexican restaurant in the shopping center next door for lunch, enjoying a pollo asada burrito with unlimited soft drinks. All for a dollar less than the venue charges for one small bottle of water. We were pleased that Samantha Stosur quietly and competently defeated one of the decibel queens of women's tennis. Screamin' Victoria Azarenka went down in two sets in the final.